Mold remediation work. 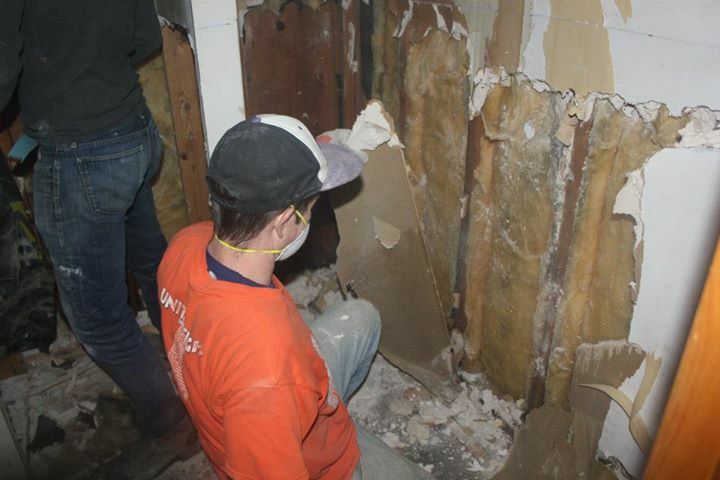 Image taken by an organization that does mold remediation work post-Sandy. This past Sunday, October 13th, was International Day for Disaster Reduction (IDDR), a day that not only celebrates how people and communities are reducing their risk to disasters and raising awareness for Disaster Risk Reduction, but also encourages every citizen and government to take part in building more disaster resilient communities and nations. As New Yorkers reflect on the approaching one-year anniversary of Hurricane Sandy and recall the many residents that are still recovering from the storm, we are also thinking of how to build more disaster resilient communities and nations. This year’s IDDR theme, “Living with Disability and Disasters”, focused on some one-billion people around the world living with some form of disability, representing one-fifth of the world’ population who are often overlooked. In that spirit, this blog post focuses on mold remediation. Earlier this year, I had the opportunity to conduct an interview with a first responder, who later became a mold remediator, to learn about the specifics and the importance of mold remediation. What at first began as simply providing water pumps and generators to locals and homeowners and helping homeowners pump out water from their homes for the interviewee, eventually turned into something bigger. And although the interviewee had a full time job before and during the storm, they never went back to it after and wounded up doing disaster relief work full-time. As a result of these and other efforts, an organization was formed. The organization immediately realized that a lot of homes in disaster zones were not having the proper site safety checks, and so the group went into homes to look for serious hazardous damages, from oil spills to natural gas fumes. During this process, the organization recognized the acute lack of awareness of and knowledge about the mold that was growing in homes. There have been many organizations post-Sandy doing “mold suppression,” but the interviewee noted that there is actually no such thing as “mold suppression” and in actuality those groups were usually spraying bleach, which does more harm than good by giving homeowners a false sense of relief and security. To ensure the proper and full removal of mold and spores from homes and other types of buildings, there are actually other various crucial steps and procedures that, depending on the type of building and severity of the problem, one can and should take instead of just using bleach and other ammonia products. Eliminate or limit water or moisture sources. Decontaminate or remove damaged materials, as appropriate. Dry any wet materials by opening doors and windows and using fans or dehumidifiers to dry out the building. Scrub affected areas to remove visible mold and let it settle after for at least 30 minutes. Remove all porous items that have been wet for greater than 48 hours and that cannot be thoroughly cleaned and dried. Vacuum all surfaces from top to bottom. Wiping and disinfecting areas by using warm water mixed with a mild dish detergent, and damped cloth rags. Mold remediation protective wear. 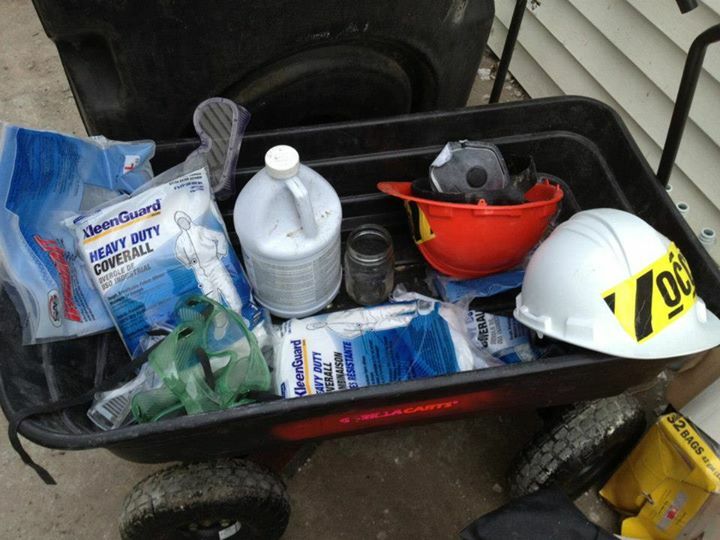 Image taken by an organization that does mold remediation work. Attached here is a brief mold remediation guide from US Environmental Protection Agency. And here is another brief guide for mold remediation from Respond & Rebuild, an organization that does mold remediation and Sandy relief work. It is easy to forget the small yet critical aspects of recovery, like mold remediation. Mold is one of several invisible, chronic, accumulative effects of disasters that stretch the crisis beyond the storm event and its immediate aftermath. 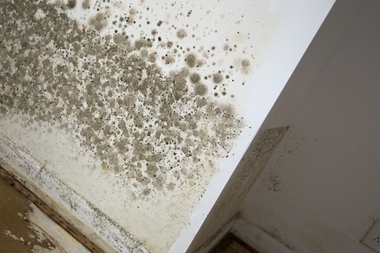 One year after Hurricane Sandy, mold has become an even more apparent and increasing problem. Schools and buildings that have had mold remediation work done has recently found mold resurfacing. There has also been an increasing number of mold-related respiratory diseases. As local governments begin to offer mold remediation assistance and along with varying organizations begin and continue to offer mold remediation courses, it is essential that we need to build more mold awareness for a better and more resilient storm recovery.